Occasionally some object comes along that I find irresistible, not necessarily for what it is but what I imagine that it could be turned into. Sometimes, it (or they) were destined to be lamps, sometimes some other thing, but whatever they become, the starting object is one-of-a-kind, at least in my experience. Pictured here are a couple of tables that started from a 23" barn feeding trough, hand-hollowed in the 19th century from a single sizeable log into something more usable. I didn’t notice the trough until the barn I’d bought for its siding and beams was being dismantled,. What a kick when I saw it. I turned it into two, very different one-of-a-kind pieces. This is my kick off of occasional “one and only’s.” I don’t expect to find more starters like them, so it’s a first come, first served; actually it’s first come, only one served. If you are interested in owning it, e-mail us or call (412) 488-4468. 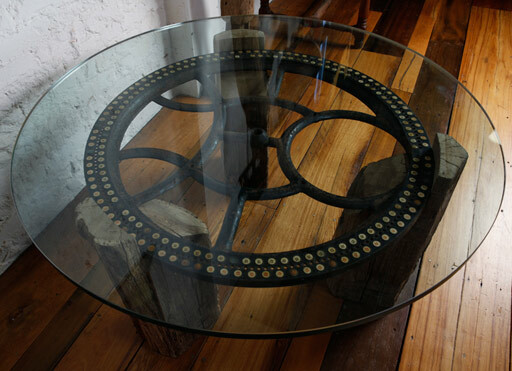 The rectangular coffee table is the two ends of the trough, side-by-side, topped with glass and lying on two sections of hewn logs from a period Pennsylvania log cabin. The second consists of cross cut sections of the trough arranged feed side alternately in and out, supporting a circular glass top.